• ​ These education databases can be searched separately or together, along with the multidisciplinary Academic Search Complete and other EBSCOhost databases. 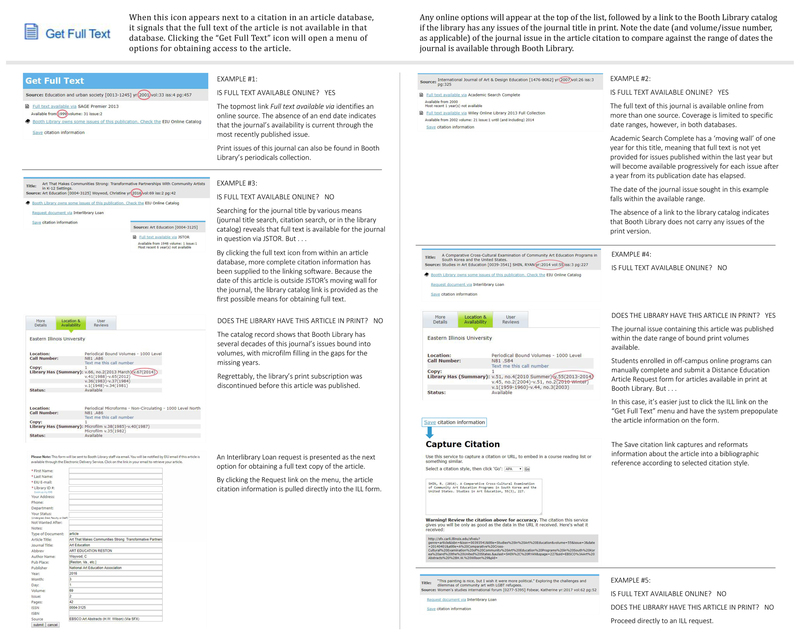 • ​ ERIC is also available in an open access web version. • ​ For more, see the full list of Education Databases. • ​ Bibliographic citations and summaries for articles, including some full-text and peer-reviewed sources. • ​ ​Cross-searchable with Academic Search Complete, Humanities International Complete, and other EBSCOhost databases. Consult the EBSCOhost User Guide for information on how to optimize your use of these research databases. • ​ Multidisciplinary databases of full-text peer-reviewed articles. Depending on the interdisciplinary aspects of your paper topic, you may wish to search additional Resources by Subject. 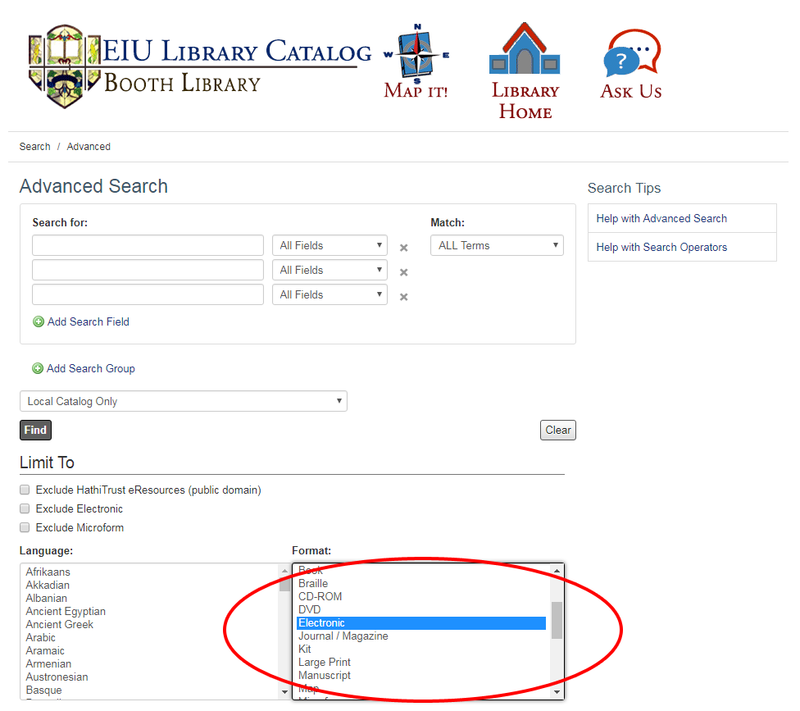 If using Google Scholar, set up your library links for access to EIU journal subscriptions. Browse the lists of e-journals for Art, Architecture & Applied Arts and Social Sciences including Education. You can also check on availability by looking up the article citation or DOI. 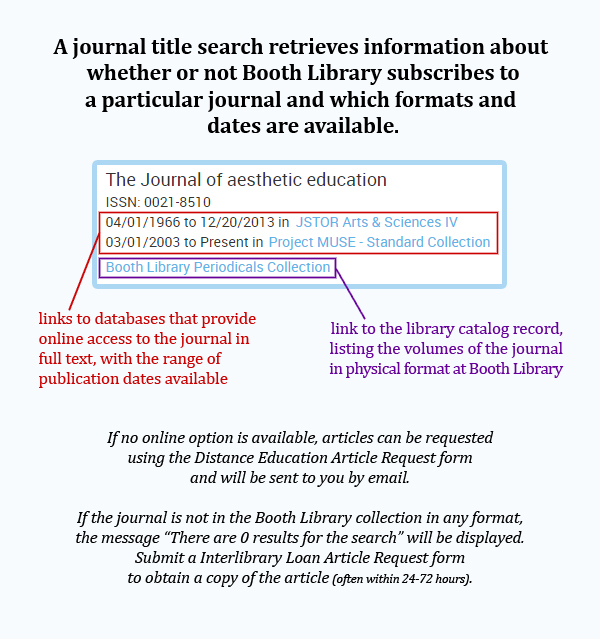 If Booth Library does not own the journal either in print or electronically, submit an Interlibrary Loan Article Request. Search the catalog of the consortium of academic and research libraries in Illinois. View the complete list of eBook Resources. 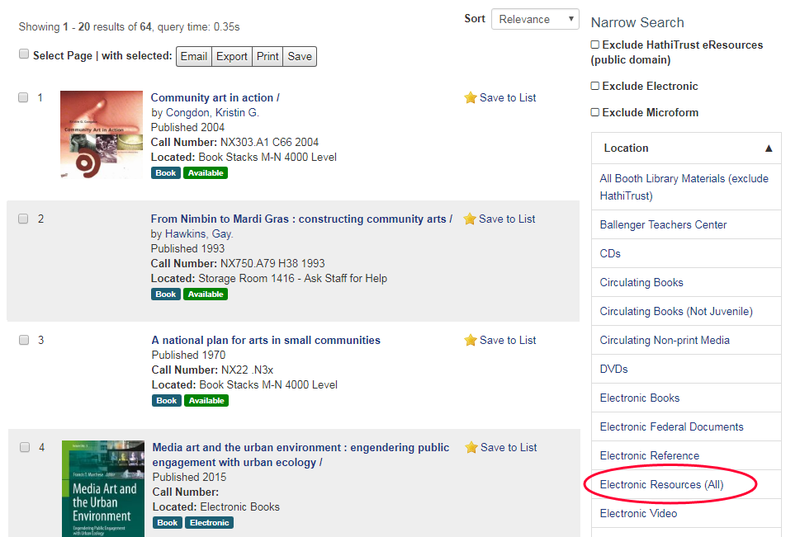 eBooks can also be found by searching the library catalog or the resources listed in this guide. ​This encyclopedic resource (including subject entries, biographies, images, and bibliographies) provides access to Grove Art Online, The Concise Oxford Dictionary of Art Terms, Encyclopedia of Aesthetics, and The Oxford Companion to Western Art. ​NOTE: Limited to 3 users at a time. The website for Booth Library's collection of teaching and learning materials includes links to Education Web Resources, Practical Sites for Teachers, and Sites for Kids. Professional associations, advocacy organizations, government agencies, and museum websites may also be good sources of information. Use your EIU NetID and password (same login as for D2L) for remote access to library resources. Books from Booth Library can be delivered to you by mail. Articles will be emailed to you. For more information about returning books as well as eligibility for this service, please see the Distance Education Loan Policy. To renew items, use your I-Share Account. Your library ID number is located in the lower right corner of your Panther Card or Student I.D. Card (14 digits beginning with 2 2211 0____ ____). Another way to find your library number is Library ID Lookup. 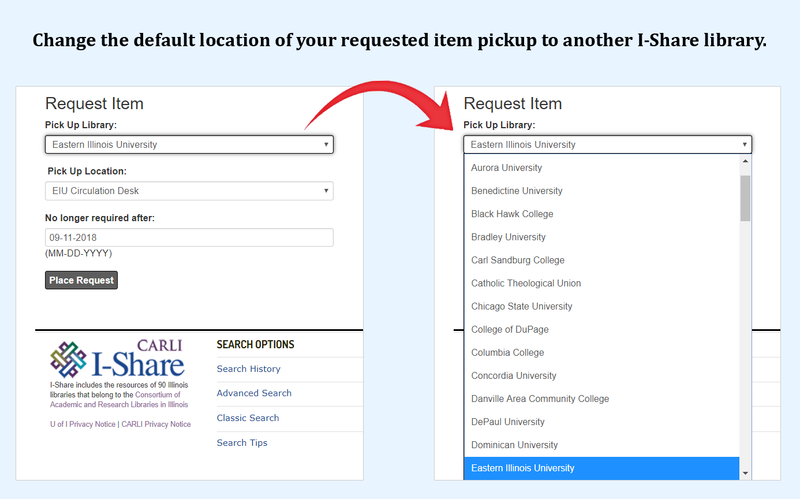 For resources that are not available at Booth Library, you may borrow materials from other college and university libraries in Illinois by submitting a request in I-Share. For resources that are not available through I-Share, use an Interlibrary Loan request form. Items requested through Interlibrary Loan will be shipped to Booth Library by the lending library. We will then mail the item directly to you. ILL items can be returned at any I-Share location. Items requested through Interlibrary Loan will be shipped to Booth Library by the lending library. We will then mail the item to you, along with an address label for the item's return to the Booth Library ILL Dept. Please allow enough time for us to ship the item back to the lending library before its due date. You may need to request an extension of the loan period in order to avoid incurring overdue fines. If you have questions about your library account, call the Circulation Desk at 217-581-6071. For Interlibrary Loan concerns, call 217-581-6074. You can manage your citations with freeware such as Mendeley or Zotero.